January 9, 2012 - Snowmageddon 2012. Or "Omighad it snowed - lets all drive like we're insane." Image was pretty simple - 5dII on a tripod. with a Zeiss Distagon T* 28mm f/2.8 lens. Exposure 4/10th of a second, f/8.0, ISO 400. Lit with a 2 AA-Cell Maglite, with the LED bulb. Used a Canon RS-80n3 wired remote trigger to fire the shutter. The Good: quick and easy here. 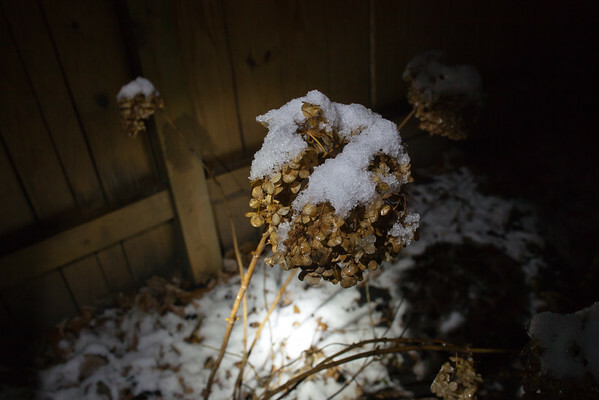 Found a bit of snow on the hydrangeas, parked the tripod and fired a few shots off. Was using "P" program mode, so let the camera do most of the thinking. Played the light around a bit, which if you want, you could call it light painting. I'm not thinking it was fancy enough for all that. The LED light is a good bright bluish white - there's a lot of power in a small "spot-light" kind of package. Who needs a "gridded spot"?? The Bad: Another Quick and Easy shot with "ya get what you pay for" results. Could have done some more composing. Here we have another big ball of stuff, basically in the middle of the frame.